Like a slow brewing revolt against the establishment (a trend we are seeing socially and politically around the world), the exponential advances in technology development are beginning to evoke a contra stance. A push-back. Not because we want less of them. In fact, our appetite for better, faster, cheaper technology – software and hardware – can only be described as voracious, and insatiable. More is more. Rather, it’s because these mechanical, arithmetic and increasingly invasive technologies are leaving us feeling cold, controlled and ironically, disconnected. After decades of building technology to make humans more effective or eliminate the need for their involvement in all manner of tasks, from washing the dishes to assembling cars, we reach a point at which efficiency and automation are no longer enough. It’s become de-humanizing. Then, earlier this year, Taiwanese dancer, choreographer and inventor, Huang Yi, recorded a dance duet with a robot, accompanied by a solo cellist. As I watched in awe of the machine’s subtle, flowing movements and the clearly emotional connection Yi had to it, I wondered whether I was observing an intimate love story or just some freaky techno-art. And why are we striving so hard to enhance this symbiotic relationship between humans and technology? It seems we want our technology. And we want it to be more human. Living creatures seek a state of equilibrium, or homeostasis – the physiological and psychological drive to reduce tension and maintain internal stability. When we are cold, we reach for a sweater; when we are hungry, our attention turns to food; and when we are confronted with ambiguity, we search for certainty. Today’s technology is making many feel the discomfort and dissonance that comes with being out of balance – that this unrelenting focus on technology advancement is somehow leaving us behind. The technology pendulum has swung – from one end, where the focus has been squarely on the technology itself: the code, the programs, the applications. Science and engineering. To the other end, where the quality of the experience reigns supreme and user engagement is the main game. Art and design. Confronted with dichotomous extremes, the tendency is to re-center. Left brain, right brain. Hard skills, soft skills. We come to know that there are strengths and concentrations at either end of the spectrum and the true value lies in their combination, not their divergence. Humanizing technology by design that synthesizes art and science helps to restore homeostasis and return us to equilibrium. We humans experience the world through our five senses. Machines do not. And that is why we see the evolution of technology – devices and apps – increasingly attempting to communicate with us they way that we know how. Such as using conversational interfaces, like chatbots, that are integrating advances in voice recognition and natural language processing technologies to make us feel like we’re talking with a real human. Or visual interfaces, including augmented and virtual reality that tap into human visual dominance to create immersive experiences that ‘fool’ our brains into believing what we see. Or biometric sensors that track and monitor our activity and wellbeing, and draw us into an endless narcissistic journey to understand and actively manage our minds and bodies. We will continue to see the evolution of technologies that are far more sensate than they are mechanical. At the science and engineering end of the spectrum, there is alignment to human IQ: knowledge and know-how. Facts, data, logical reasoning and sequential processing. We are progressively surrendering this type of intelligence to the superiority of machines. We are stepping aside and handing over to technology, the jobs and tasks that require it. But having the smarts without having the heart is not enough either. Social intelligence is a mammalian capability and emotional intelligence a distinctly human one, neither of which technology can currently lay claim to. Humanizing technology will require software that has been reverse-engineered from the human experience it delivers, rather than its technical functionality or sophistication. For example, humans learn more comprehensively and engage far better through story-telling and human-to-human interactions than they do from non-human interfaces. Humanizing technology is the natural progression of our digital journey. Steve Jobs can be credited as one of the inaugural architects of the transformation in how we think about, and use, technology. Many more have followed him. Our digital future is riddled with social, moral and ethical challenges – some of which we foresee quite clearly and many more we have not even imagined. 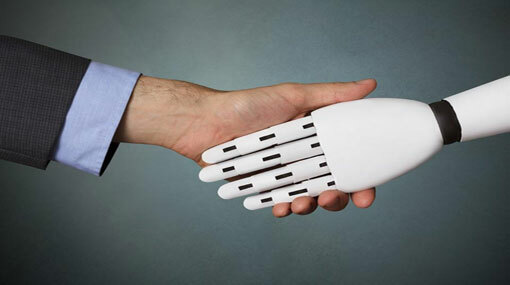 Humanizing technology should be about more than making technology look, sound and feel human. It should advance humanity. Push-forward.